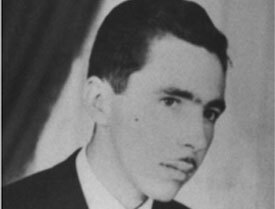 In Brazil during the 1950's worldwide "UFO Flap" comes a report of one of the most bizarre accounts on record—the seduction of Antonio Villas Boas. 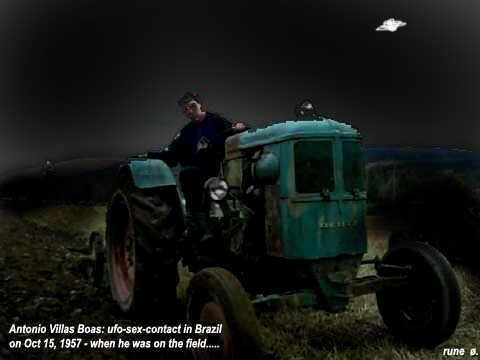 The first recorded incident of a UFO abduction in the modern age happened to the 23 year old Brazilian on October 15, 1957. It also stands as a well documented "physical" case with doctors examining the effects after his encounters. Researcher Bruce Rux relates, "reluctant to tell his story, Boas was convinced by Dr. Olavo T. Fontes, Professor of Medicine at the National School of Medicine of Brazil and also an APRO representative, to publicly relate what happened, which he did on February 22 of the following year to Fontes, journalist Joas Martins, and a Brazilian military intelligence agent. Boas had been found to be suffering from radiation poisoning, and Fontes was curious. Among the symptoms were 'pains throughout the body, nausea, headaches, loss of appetite, ceaslessly burning sensations in the eyes, cutaneous lesions at the slightest of light bruising...which went on appearing for months, looking like small reddish nodules, harder than the skin around them and protuberant, painful when touched, each with a small central orifice yielding a yellowish thin waterish discharge.' The skin surrounding the wounds presented 'a hyperchromatic violet-tinged area.' 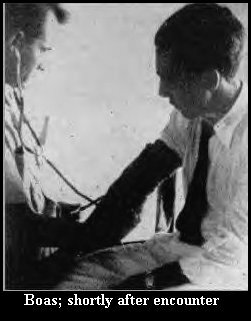 The military intelligence man interrogated Boas, and he was subjected to a battery of physical and psychological tests. The most conservative of UFOlogists accept his abduction as an actual occurrence." 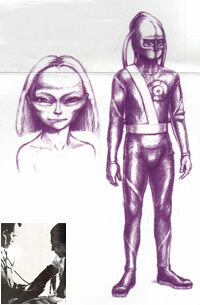 While the actual abduction occurred on the 15th, his strange encounters began ten days earlier. A little after 11 PM on October 5, Boas spotted a bright white light in the sky as he opened the window to get some air. Later that night after sleeping for awhile Boas awoke and looked again to find the same light still there, moving toward him as he looked at it. Frightened, he slammed the shutters, waking his brother, who watched with some astonishment as the bright light played through the shutters awhile before leaving. Boas lived on his family's farm. They had several fields and plantations, which they farmed at night to beat the heat in the daytime. On the 14th, around 9-10 PM, Boas again with his brother, were out tilling the fields, when they both witnessed an extremely bright light a little over three hundred feet above their heads. Boas, leaving his brother behind, set out to investigate. As he got closer it "suddenly darted away at tremendous speed to the opposite end of the field. He approached it again, and again it darted away, back to where it had started from. This maneuver was repeated 'no less than twenty times.' At last discouraged, Boas returned to his brother." Boas said, "The light kept still for a few moments longer in the distance. Now and again it seemed to throw forth rays in all directions, the same as the setting sun, sparkling. Then it suddenly disappeared, as if it had been turned off. I am not quite sure if this is what actually happened, for I cannot remember if I kept looking in the same direction all the time. Maybe for a few seconds I glanced elsewhere so it may have lifted up and disappeared before I had the time to look back again." The next night he worked the fields alone, and when he was at the same spot he and his brother had witnessed the light the night before, he saw a reddish light in the sky which zoomed toward him at remarkable speed, "so quickly that it was on top of me before I could make up my mind what to do about it." About 160 feet above his head, it stopped suddenly. This light was so intense that he couldn't see his tractor's headlights through it at 1 AM. Boas said it looked like "a large elongated egg" with several technical features about it. Three legs extended from beneath it, and as it settled to land, Boas ran to his tractor in terror. When he reached it, the tractor and its lights died. Making his escape out the other side and running toward the house, his arm was grabbed by "a small figure (it only reached to my shoulder) in strange clothes, which he violently shoved away. Three more small figures surrounded him and lifted him off the ground by the arms. Boas described these creatures in great detail, "All...of them wore a very tight-fitting siren-suit, made of soft, thick, unevenly striped gray material. This garment reached right up to their necks where it was joined to a kind of helmet made of a grey material that looked stiffer and was strengthened back at nose level. Their helmets hide everything except their eyes, which were protected by two round glasses, like the lenses in ordinary glasses. Through them, the men looked at me, and their eyes seemed to be much smaller than ours, though I believe that may have been the effect of the lenses. All of them had light-colored eyes that looked blue to me, but this I cannot vouch for. Above their eyes, those helmets looked so tall that they corresponded to what the double of the size of a normal head should be. Probably there was something else hidden under those helmets, placed on top of their heads, but nothing could be seen from the outside. Right on top, from the middle of their heads, there sprouted three round silvery metal tubes (I can't tell whether they were made of metal or of rubber) which were a little narrower than a common garden hose. The tubes, which were placed one in the middle and one on each side of their heads, were smooth and bent backward and downward, toward the back. There they fitted into their clothes; how I cannot say, but one went down the center, where the backbone is, and the other two, one on each side, fitted under the shoulders at about four inches from the armpits—nearly at the sides, where the back begins. I didn't notice anything at all, no hump or lump to show where the tubes were attached, nor any box or contrivance hidden under their clothes. "Their sleeves were narrow and tight-fitting to the wrists where they were followed by thick five-fingered gloves of the same color, that must have somewhat hindered their movements. As to this, I noticed that the men weren't able to double their fingers altogether, so as to touch the palms of their hands with the tips of their fingers. The difficulty did not prevent them from catching and holding me firmly, nor from deftly (later) manipulating the rubber tubes for extracting my blood. Those overalls must have been a kind of uniform, for all the members of the crew wore a red badge the size of a pineapple slice on their chests, and sometimes it reflected a shiny light. Not a light of its own, but reflections such as those given by the rear lights of a car, when another car lights it up from behind. From this center badge there came a strip of silvery material (or it might have been flattened metal) which joined onto a broad tight-fitting claspless belt, the color of which I can't remember. No pocket could be seen anywhere, and I don't remember seeing any buttons either. The trousers were also tight-fitting over the buttocks, thighs, and legs, as there was not a wrinkle nor a crease to be seen. There was no visible hem between the trousers and shoes, which were actually a continuation of the former, being part of the self-same garment. The soles of their shoes, were different from ours: They were thick, about two or three inches thick, and a little turned up (or arched up) in front, so that the tips looked like those described in the fairy tales of old, though the general appearance was that of common tennis shoes. From what I saw later, they must have fitted loosely, for they were larger than the feet they covered. In spite of this the men's gait was free and easy, and their movements were swift indeed. Perhaps the closed siren-suit they wore did interfere slightly with their movements because they kept walking very stiffly. They were all about my height (1.64 meters tall, in shoes), perhaps a little shorter because of those helmets, except for one of them, the one who had caught hold of me out there—this one did not even reach my chin. All seemed strong but not so strong that had I fought with one of them one at a time I should have been afraid of losing. I believe that in a free-for-all fight I could face any single one of them on an equal base." At this point, while resisting as best he could, Boas found himself being pulled up a flexible metallic rolling ladder into a hatchway, which closed behind them "so neatly that no seam was visible to the naked eye." Now he found himself inside a small square room, bare of furnishings, brightly lit—"the same as broad daylight"—by recessed square lights in the smooth metallic walls. Suddenly an opening appeared, from the seamless wall, and Boas was led into another room. "The only furnishings visible was an oddly shaped table that stood at one side of the room surrounded by several backless swivel chairs (something like barstools). They were all made of the same white metal. The table as well as the stools were one-legged, narrowing toward the floor where they were either fixed (such as the table) to it or linked to a moveable ring held fast by three hinges jutting out on each side and riveted to that floor (such as the stools, so that those sitting on them could turn in every direction)." His abductors then grabbed and held him in place while communicating in sounds that had "no resemblance whatever to human speech...I can think of no attempt to describe those sounds, so different were they from anything I have ever heard before...Those sounds still make me shiver when I think of them! It isn't even possible for me to reproduce them...my vocal organs are not made for it." He compares the sounds to animal grunts, "some...longer, others shorter, sometimes containing several different sounds at the same time, at other times ending in a tremor." Boas says he was left alone for about an hour and made himself comfortable on a large, featureless foam rubber-like gray bed or couch in the middle of the room, with no legs. From holes in the wall from about the height of his head came tufts of gray smoke that quickly dissolved. At first, Boas felt nauseated and as though he was being suffocated. Then he rushed to one corner of the room, vomited, and after that his breathing was easier. A little while later a door opened and in walked a naked woman! Ralph Blum:"Villas Boas speculated that the clear liquid was an aphrodisiac; to my mind the 'logic' of the story suggests that it was a germicide of some kind; and that the 'smoke' was a chemical that permitted the alien to breathe without her helmet (the rest of the crew wore helmets throughout the encounter). It could be that the blood was relevant to some criteria of interbreeding." "She came in slowly, unhurriedly, perhaps a little amused at the amazement she saw written on my face. I starred, open-mouthed ... she was beautiful, though of a different type of beauty compared with that of the women I have known. Her hair was blonde, nearly white (like hair dyed in peroxide)—it was smooth, not very thick, with a part in the center and she had big blue eyes, rather longer than round, for they slanted outward, like those pencil-drawn girls made to look like Arabian princesses, that look as if they were slit ... except that they were natural; there was no makeup. Her nose was straight, not pointed, not turned-up, nor too big. The contour of her face was different, though, because she had very high, prominent cheekbones that made her face narrowed to a peak, so that all of a sudden it ended in a pointed chin, which gave the lower part of her face a very pointed look. Her lips were very thin, nearly invisible in fact. Her ears, which I only saw later, were small and did not seem different from ordinary ears. Her high cheekbones gave one the impression that there was a broken bone somewhere underneath, but as I discovered later, they were soft and fleshy to the touch, so they did not seem to made of bone. Her body was much more beautiful than any I had ever seen before. It was slim, and her breasts stood up high and well-separated. Her waistline was thin, her belly flat, her hips well-developed, and her thighs were large. Her feet were small, her hands long and narrow. Her fingers and nails were normal. She was much shorter than I am, her head only reached my shoulder ... Her skin was white (as that of our fair woman here) and she was full of freckles on her arms. I didn't notice any perfume ... except for a natural female odor ... And another thing I noticed was the hair in her armpits was bright red, nearly the color of blood." Bruce Rux points out that "a later recounting of Boas's story included the mention that her pubic hair was also bright red, which may have omitted from the original publication of Boas' encounter due to the sexual mores of the time. Details of his encounter which followed were not published either, but apparently he did discuss them—albeit with some embarrassment—when relating his story to Dr. Fontes and Mr. Martins." Boas recounts that the woman came toward him "in silence looking at me all the while as if she wanted something from me." Pressing herself to him, he understood what her purpose was. "I began to get excited ... I ended up forgetting everything and held the woman close to me, corresponding to her favors with greater ones of my own." Apparently, they had two sexual encounters and performed a variety of acts together for about an hour, after which the woman pulled away to leave. "[A]ll they wanted [was] a good stallion to improve their stock," Boas would say. He said that he enjoyed the encounter, even if the woman refused to kiss. Bruce Rux remarked that after all, he had just thrown up. Instead the "woman" preferred to bite his chin, while making sounds, that in Boas' mind, sounded like "animal growls." She never spoke. When they were finished , one of the other creatures entered and called out to the woman. "But before leaving, she pointed to her belly, and smilingly (as well as she could smile) pointed to the sky—southward, I should say. Then she went away. I interpreted the signs as meaning to say that she intended to return and take me with her to wherever it was she lived." He seem to be concerned, or even afraid about the last, "for he took the meaning quite seriously and wasn't sure if he was anxious to leave his familiar surroundings or his family," Rux writes. After fetching the woman, the creature returned Boas' clothes. He was led back to the room with the stools and table, were the crew sat and communicated with each other in their strange way, ignoring him. He felt altogether calm, "for I knew no harm would come to me." Now he had a chance to take stalk of his surroundings, and he tried to remember all he could. He noticed that the walls were smooth, metal and hard, with no windows anywhere. Noticing a box with a glass top that had the appearance of an "alarm clock," he attempted to conceal it. Noticing this, one of the crew seized it instantly and shoved him back. Jacques Vallee said that Boas described the clock as having one hand and several marks that would correspond to the 3, 6, 9, and 12 of an ordinary clock. However, although time passed, the hand did not move, and Antonio concluded that it was no clock. "The symbolism in this remark by Villas-Boas is clear", Vallee injects. "We are reminded of the fairy tales ... of the country where time does not pass, and of that great poet who had in his room a huge white clock without hands, bearing the word 'It is later than you think.'" The creatures continued to lead him through the ship, pointing out various interesting features which Boas described at length with a remarkable amount of detail. Boas stressed that there was no doubt in his mind whatsoever that he was aboard a metal craft. The tour finally over, one of the figures gestured him down the ladder, then pointed to itself, to the ground, "and then in a southerly direction in the sky," the same direction the woman had pointed. Boas was signaled to step back, and the ladder retracted, the ship rose, the tripod landing struts retracted—once again, so smoothly that once in place no sign of the opening through which they had emerged was visible—and stopped a little over a hundred feet above his head, "[growing] increasingly brighter. The buzz formed by the dislocation of air grew louder, and the revolving saucer began to rotate at a terrific speed, while the light turned to many shades of color, finally settling on a bright red. As this happened the machine abruptly changed direction by turning unexpectantly and producing a larger noise, a kind of 'shock' ... When this was over, the strange airship darted of suddenly like a bullet southward, holding itself slightly askew, at such a heady speed that it disappeared from sight in a few seconds." It was about 5:30 in the morning when Boas returned to his tractor, by his reckoning four and a quarter hours from the time he had been picked up. He discovered the tractor had been sabotaged, presumably during the scuffle, meaning that his abductors were smart enough to know he would try escaping and that they had knowledge of how a tractor works: the battery wires had been detached. For about three months after his encounter, Boas suffered various mild medical ailments such as those described above, and excessive sleepiness, a trait commonly found in subsequent abduction cases. Antonio Villas withdrew from public life to continue his studies, receiving a law degree and becoming a practising attorney in the city of Formosa, Gojas. He died in 1992 in the city of Ubera, in Brazil's Triangulo Minero.